The wings are a blend of two colours: front half of the wings are a pale tan with the bottom a bronzy colour. Adult moths have a wingspan of roughly 19mm. Generally found in pantries or in the kitchen area where food is present. Typically they are nocturnal so rest during the day in dark places. If disturbed when flying they will zig-zag. The Indian meal Moth (Plodia Interpunctella) is often referred to as the pantry moth or flour moth. The larvae stage of the lifecycle are commonly known as ‘waxworms’ and are a common grain-feeding pest found throughout the world. This type of moths’ larvae feeds on cereals, nuts, seeds and other dried foods. Food moth infestations usually originate from contaminated food products. Adult Indian meal moths are roughly 8-10mm in length and typically have a wingspan of 16-20mm. The outer half of their wings are dark grey or bronze in colour, while the upper are yellowy in colour with a dark band between. The larvae are a creamy, white colour with brown head and can grow up to 12mm in length. Indian meal moths are more active at night but will fly towards any lights that may be on. The entire life cycle of the Indian meal moth can take anywhere between 28 and 300 days, with temperature being the main factor. Females may lay 60-400 eggs at any one time and they will always do so on food. Generally the eggs are less than 0.5mm, not very sticky and hatch into larvae within 2-14 days. Identifying Indian meal moths should be relatively easy as they have a rather unique appearance. Like all food moths they feed on stored, dried foods. So it’s always wise to look inside food containers, often the larvae will be present in the food. 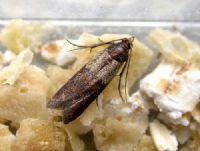 They don’t cause damage in a conventional way like carpet moths, but what they will do is contaminate any foods they are found in. Discard any infested produce and remove or store away any remaining foodstuffs before treatment. 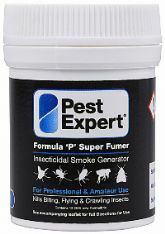 Fumigation with Pest Expert Formula 'P' Foggers is fantastic for eradicating the adult moth population as they will fill the room with an insecticide and kill any moths that are present. 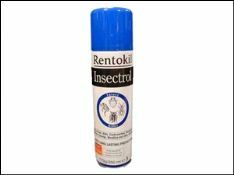 Then it’s just a case of dealing with the eggs and larvae, which can be done by applying Pest Expert Formula 'C' Food Moth Spray to the internal panels of food cupboards and anywhere moth larvae have been noticed. To prevent infestation re-occurring, make sure any dried foods are stored in sealed containers, eliminating a food source and breeding ground for these moths. General good house-keeping can help in the fight of preventing re-infestation, as well as using Demi-Diamond Food Moth Traps to monitor any moth activity. All of our food moth kits are suitable for use in both residential and professional kitchens. 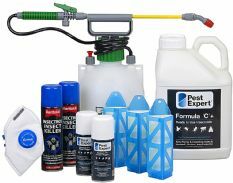 All products are from market-leaders Pest Expert and Rentokil, for customer confidence and are HSE-approved in the UK for domestic and professional use. All of our Food Moth Kits have been designed with ease of application in mind, making application simple and straightforward. A step-by-step professional advice sheet and safety mask and gloves will be provided with each of our kits.